So when I heard about Power Grid: The First Sparks, I assumed it was similar to the Dinosaur Planet/Star Fox Adventures situation: a decent game had been developed but needed the crutch of strong source material to pass muster. However, after several plays of The First Sparks, I can say that this game has truly earned its Power Grid moniker. But how does it stack up against its predecessor? Find out below! Power Grid: The First Sparks takes what many of us know and love about Power Grid and streamlines it into a game for 2-6 players that, according to the box, plays in around 60 minutes. It is set in prehistoric times, and players work to expand their clans by hunting and gathering, obtaining tools, and gaining knowledge. The game ends in the round when one player has expanded his clan to thirteen or more members, and the player with the largest clan wins. This board has four double hexes put together. The circles in the center show which kind of food is hunted on that hex. To set up the game, randomly choose one double-hex gameboard piece for each player. 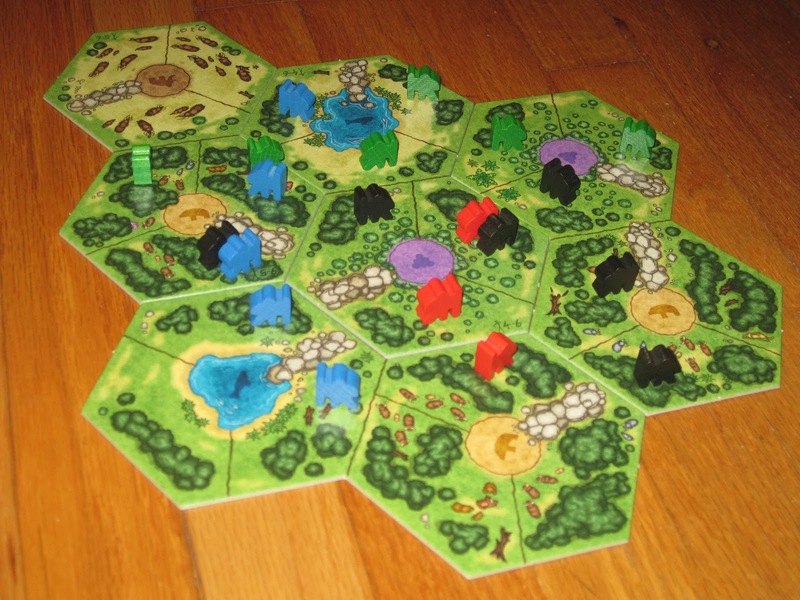 Players may set up the board in any way they choose so long as each attached board is connected along at least two edges. Each hex is divided in three sections and has a hunting ground in its center. 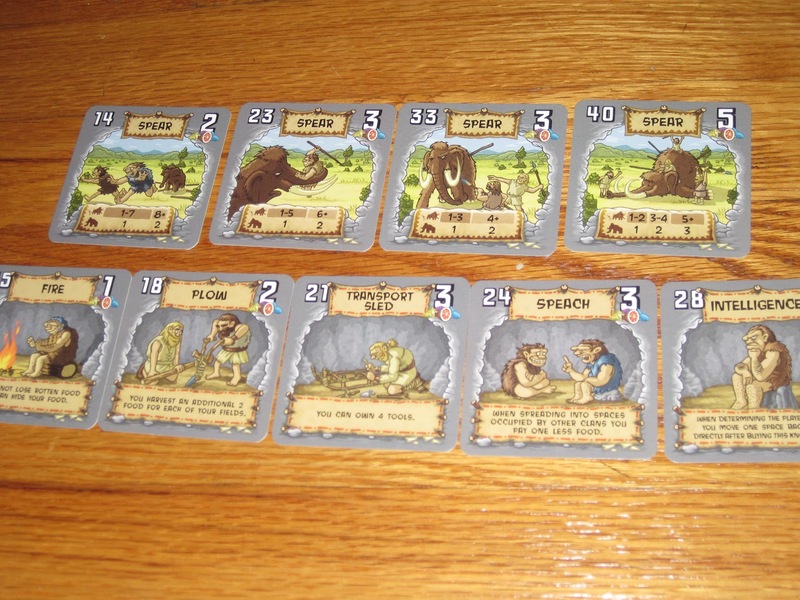 Next, using an included chart and the number of each type of hunting ground on the board, players determine how many of each food source are used to refill the hunting pool each round. Finally, each player receives a random herbs card numbered 1-6 and seven food. The herbs cards determine initial turn order, and beginning in reverse turn order, players place their first clan member for free anywhere on the board. Then, each player in reverse turn order may decide to place a second clan member on the board. Technology/tools cards numbered 7-14 form the starting market, and the remaining cards are shuffled and placed face-down to form a draw pile. A basic round in The First Sparks follows four phases: obtain tools and knowledge, hunting and feeding, expanding your clan, and bureaucracy (a holdover from Power Grid terminology). The second phase happens in reverse turn order. Each player uses their tools to hunt for food. A player must be around a hunting ground and have a tool of its type in order to hunt resources. (For example, a player must be around a pond and have a fishing rod to fish.) Early tools generally allow players to gather fewer resources, while later tools allow better hauls. The resources in each hunting pool are intentionally limited, and players must watch each other to see which resources are being fought over. If the other players deplete the pond of fish before it’s your turn, you’re out of luck. (This is why turn order is very important.) After each player has hunted, players must pay one food for each clan member they have on the board. The third phase also happens in reverse order. Players may place more of their cave meeples on the board by paying food. Players pay an increasing base cost depending on how many meeples they place on the board plus additional costs depending on how many other meeples are already on that space. The final phase is bureaucracy, which resets the board for the next round. It’s here that the player order is set. Turn order is determined first by number of meeples on the board and then by technology and knowledge cards (higher number means higher in turn order). Then the hunting areas are restocked with food and the technology market is set for the next round. The game ends before the bureaucracy phase in the round when a player places his thirteenth cave meeple. The player with the largest clan wins. I’ve really enjoyed my plays of Power Grid: The First Sparks. Like I said, unlike Star Fox Adventures, the Power Grid title feels apt, even though there’s no “grid” in the game and really no “power.” Despite this, the mechanisms are liberally borrowed from the original Power Grid and re-implemented into a new, fresh, and streamlined game. Because of its relationship in flavor, I like it quite a bit. The components in this game are fantastic. The first thing to notice about The First Sparks is the components. These are some of the best I’ve seen. 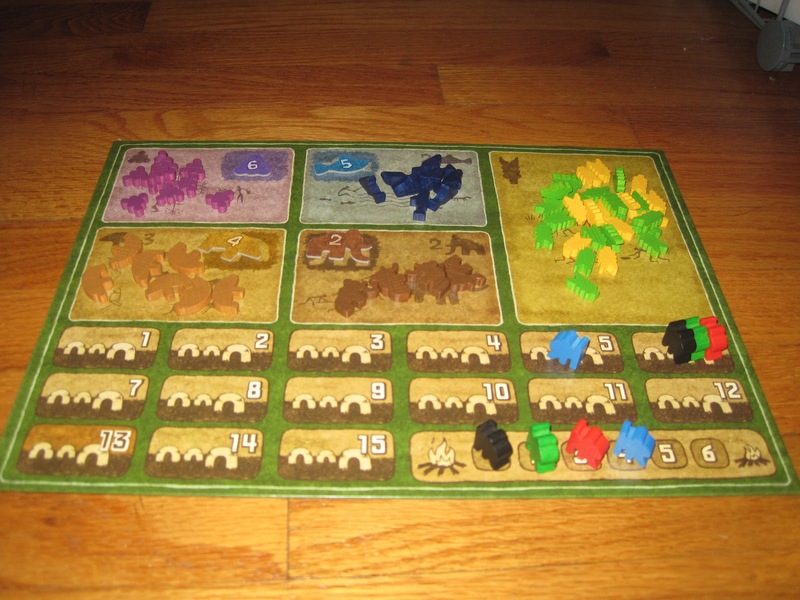 All of the clan members and the food tokens (grain, berries, fish, bears, and mammoths) are wooden pieces, the board and hexes are on very sturdy cardboard, and the artwork is fantastic. The artwork is also varied, so the lower-level spear (which shows cavemen running away) looks different from the highest-level spear (which shows a group of cavemen triumphing over their foe). This is unnecessary, but a nice touch. 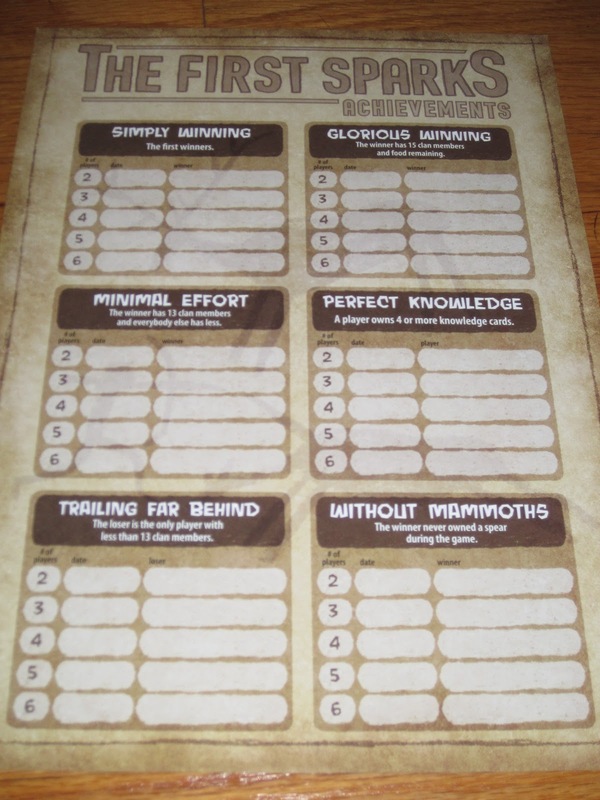 Also unnecessary is the included Achievements sheet, which allows players to enter memorable games and keep a record of winners. I love this and wish other games included something like it. Of course, these fantastic components are marred by the rampant typos in the game, and not just in the instruction manual. Costs for “expaning” your clan are reduced by the “speach” card. These egregious errors are unfortunate, but not unforgivable. I just wish there had been better proofreading done as it does cast a shadow over an otherwise fine game. One of the things I like about First Sparks (and Power Grid) is that the game has a nice catch-up mechanism for players who have fallen behind. The first player isn’t exactly penalized, but it is harder to collect resources after everyone else has collected theirs. This forces a balance between expanding (making it more likely to win, as it’s cheaper to expand by degrees than all at once) and lying low (which provides the benefits of better hunting and technology acquisition opportunities). camera steady while I took the picture. I also like the changing market. Buying a tool and hunting for food that isn’t popular can be a good strategy: the more of something there is in the supply, the more you get when you use your tool. But when other players are also hunting the same types of food, it can become harder to gather resources. I love this balance because it forces diversification and changing strategies. If nothing else, this system keeps players on their toes. 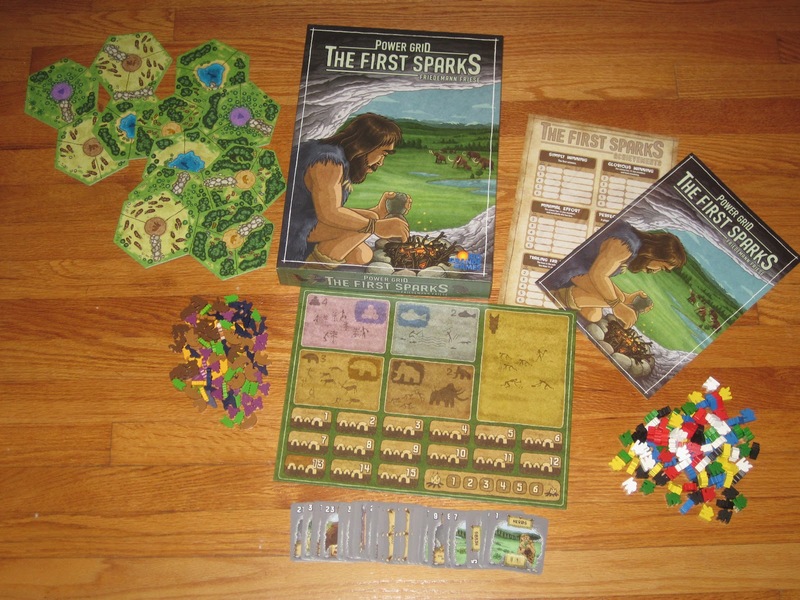 First Sparks is simpler than Power Grid as it only uses one currency: food. Players use food to “power their plants” (feed their cavemen) and to pay for expansion, growth, and new tools. In some ways this is easier; in other ways, as different food sources are worth different amounts of food, this can be harder for new players to grasp. One currency makes good sense, and the game retains enough Power Grid flavor to be satisfying while still allowing shorter and simpler gameplay. But First Sparks has one major problem to me: its playing time. I bought First Sparks because it advertised a Power Grid experience in 60 minutes. While it’s true that First Sparks is shorter, I have yet to fit a game in the stated time frame. Granted, so far I’ve had at least one newbie in each game (to whom all Power Grid concepts are foreign), but this is still a disappointment. While The First Sparks makes a great hour-long game, if it lasts 90 minutes (as some games have), I’d much rather play the original Power Grid. I don’t think this will be a problem for groups that are more familiar with Power Grid, and I can see this game getting down to 60 minutes eventually. But I would be prepared for a longer playing time initially. I’ve also noticed that in every game I’ve played, the first player to get the “Fire” knowledge card has won the game. I don’t think I’ve played enough times to call this a flaw; it could just be a coincidence. But it’s worth noting nonetheless. What does all of this amount to? Power Grid: The First Sparks is an enjoyable game that delivers a satisfying Power Grid experience in a shorter (albeit longer than advertised), simpler package. If all things were equal, I would rather play Power Grid, but since they are not, and I have many more 60-90 minute slots open for gaming than 90-120 minute slots, The First Sparks is a worthy addition to my collection. Let’s be honest; Power Grid: the First Sparks is not the kind of game that gets me excited. Its theme is lite and interchangeable (obviously, since this caveman game is apparently extremely similar mechanically to a game about supplying power to modern cities), and it doesn’t do anything particularly exciting and new as far as game mechanics (again… very similar to the original Power Grid, and the “market” has a similar feel to another Friedemen Friese game, Furstenfeld). The scoreboard, with areas for food, score, and turn order. However, this game does have a few things going for it. 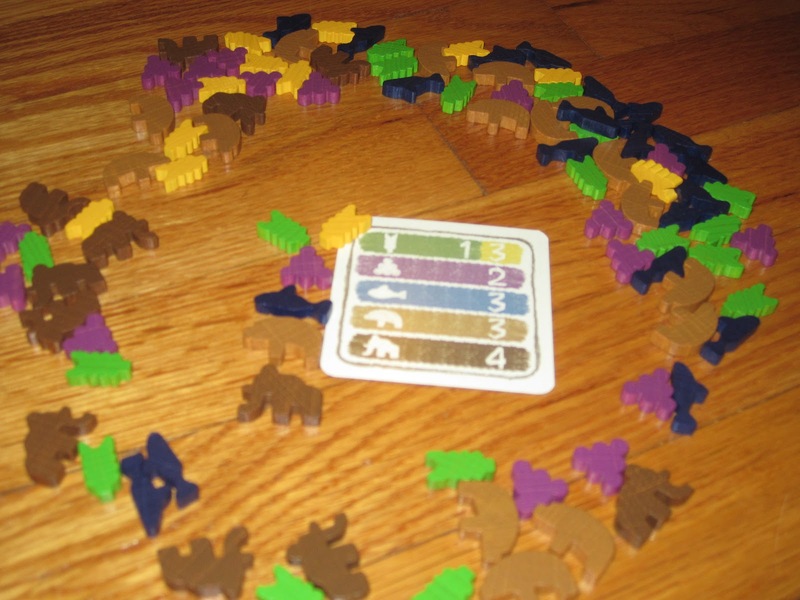 The uniquely shaped meeps – grain, berries, fish, bears, and mammoths – add a fun element of imagination to the game (mmmm, raisins…) although the caveman meeples are difficult to figure out the first time you see them. And though the boards are a rather drab green-and-brown color scheme, the colorful meeples add some life to the visual appearance. The mechanisms are solidly crafted together, although perhaps this is due in part to the test-of-time and somewhat derivative nature of the game relative to its counterpart[s]from its own designer. If you’re a fan of the designer you may enjoy the game – but don’t expect a brand new experience. I think what really makes this game a rather average experience for me is that there are actually not a whole lot of decision-making opportunities. For the most part, the game runs on rails – you get resources based on your position and the cards you have. Really, there are only 2 decisions to make each turn; which technology card you want to buy (if any), and where you want to expand (if anywhere). Usually the answer is pretty obvious – get the best tool for the resource you have access to the most of, and expand into the cheapest possible locations. In theory, this limited level of decision making should result in a game that clips along, but it still tends to push the 60 minute mark and beyond. With experienced players who know what to expect from each phase, the game should push forward rapidly, but one might hope that this would result in a 40 minute game rather than barely scraping under an hour. During the course of the game, everyone will stay pretty close. Without extremely superior tools you can’t afford to pull too far ahead, and if you fall behind you will get access to the most food and the best tools if you want them. This kind of pushes all the meaningful parts of the game into the last 2 turns. If you fall behind right then, it suddenly becomes too late to catch up, and if you can make a big move to pull ahead, you will likely maintain the lead even with much fewer resources in the last turn. Sure, if you make mistakes early on you could leave yourself in a bad position at endgame; but with the catchup mechanics, you will likely be okay. This all kind of makes the first few turns less meaningful, and I wonder if the game might have been shortened by removing turns. At least you are generally not trapped in last place for the whole game (unless you simply refuse to do anything beneficial for yourself). The market creates an interesting system of supply and demand, which cleverly adjusts the value of each type of food by it’s availability. It makes the key to victory deciding when to abandon one food type and focus on another in anticipation of it’s availability. Grapes may be only worth 2 each, but if everyone pursues Mammoths you can rack up a ton of food with the right tools and no competition. However, you are limited in this choice by the availability of tools, which is controlled by player order, which is determined by expansion… so again, everything gets squished towards the middle, only allowing a big risk to make a difference at the very end. All-in-all, First Sparks is an enjoyable experience. It’s a solid, straight-up-Eurostyle strategy game with a lite theme. It would be nice if it really condensed the Power Grid feel into more of a 30-60 minute experience instead of a 60-90 minute experience, which would make it stand out more on it’s own. As it is, though, it feels like a slightly shorter Friese game that doesn’t add anything new into the experience. I didn’t realize I had talked you out of it. The typos are distracting, but not so much so that I’d disavow the game. It might be worth waiting for a second printing, though. Do you enjoy the first Power Grid? 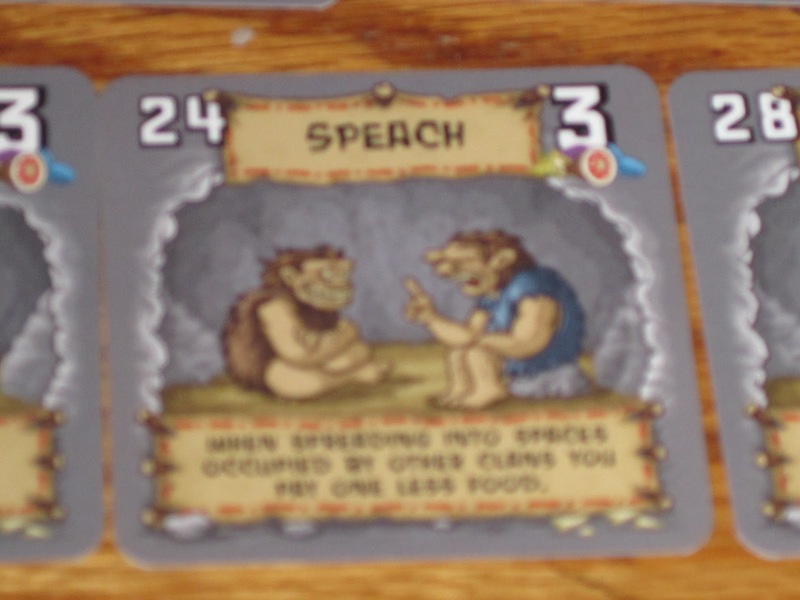 While you’re playing, “Speach” is just kinda funny. Until one player mentions the misspelling EVERY 13 SECONDS. If that’s some sort of veiled criticism, I won’t hear it, and I won’t respond to it. I do like the original Power Grid. And I also have PG: Factory Manager. I’ll probably buy it at some point, but since I have approx 40 other games that I need to play (ok, maybe more), I’ll probably be able to wait until a 2nd printing. It’s not a veiled criticism at you, Farmerlenny. It’s a veiled criticism at another player from the first game that was not you. @Wolfie: Hmmm… I don’t remember that. It must’ve been annoying.